"A vehicle which, for its size and purpose, provides the Canadian consumer with environmentally-friendly returns that compare favourably with other vehicles in its class." It is with this in mind that the AJAC's 2017 Canadian Green Car of the Year (CGCOTY) and Canadian Green Utility Vehicle of the Year (CGUVOTY) were chosen. And the big winner on the Green front this year was Toyota. 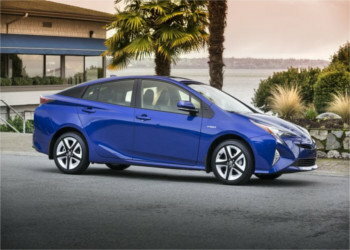 The 2017 Toyota Prius won the Canadian Green Car of the Year, while the 2017 RAV4 Hybrid took home Green Utility Vehicle top honours. Chosen for the top honour from among three finalists, the 2017 Toyota Prius was named as the CGCOTY. The Prius beat out the 2017 Kia Optima HEV and 2017 Chevrolet Malibu Hybrid to win. Meet a list of standard requirements established by the awards program. Be considered fuel efficient, based on its size, powertrain and category. Endure testing during a week-long event held in the fall of every year. 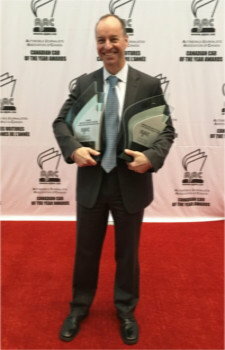 Score very well under AJAC's Canadian Car of the Year program protocol. More than 60 automotive journalists participate in the back-to-back tests that take place in the fall. They score the eligible vehicles in several different categories. These scores are then combined with objective data on factors like emissions and battery range. And, finally, scores are assigned and finalists are chosen, with a winner eventually being crowned. If you're looking to drive green and save a lot of money on gas, the 2017 Prius is a very good option to consider. According to Government of Canada/Transport Canada Test Methods, a base model Prius is rated 4.4/4.6 (City/Hwy), which is excellent. This compact car also offers a surprising amount of cargo room for its class and a comfortable all-around ride. For 2017, Toyota's Safety Sense driver assistance features now come standard on all Prius models. So, every new Prius is equipped with a rearview camera, forward collision warning, pedestrian detection, lane keep assist, and adaptive cruise control. With a starting price of $27,190 (additional fees may be added, depending on the dealer), the 2017 Prius falls into the "affordable" category for many vehicle shoppers. If, however, you're dealing with a limited budget due to poor credit, a recent-model used option may be a more practical choice. 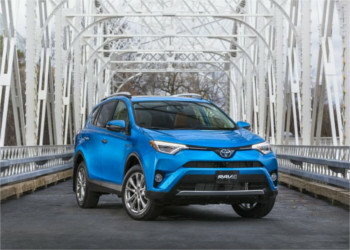 Also taking a top Green prize from AJAC was the 2017 Toyota RAV4 Hybrid. The RAV4 Hybrid was subjected to the same standards and testing procedures as the Prius. But, of course, this vehicle was rated a little differently due to its class. So, for drivers who want to be environmentally responsible with their vehicle choice, but need a little extra room, the 2017 CGUVOTY may be ideal. It should also be noted that Toyota's RAV4 is now the top-selling compact utility vehicle in Canada. 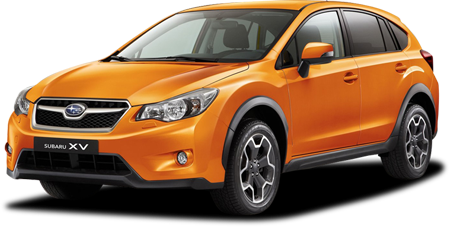 This compact SUV is a smart choice and represents a good value for small families. The Government of Canada/Transport Canada rates the RAV4 Hybrid at 10.0/7.8 (City/Hwy), which is exceptional in this segment. In addition to saving money on fuel, 2017 RAV4 Hybrid owners will get a ton of cargo space and standard features. In fact, in its class, this vehicle offers more standard features than most of its competitors. These include a rearview camera, dual-zone automatic climate control, a proximity key, a moonroof and the Entune Audio Plus infotainment system. The RAV4 Hybrid has also received high safety ratings and critical praise for its comfortable ride. For many vehicle shoppers, the only drawback to the 2017 RAV4 Hybrid may be its price. Starting at $34,455, it's one of the more expensive compact SUVs on the market. So, buyers with smaller budgets may want to look at similar, but more affordable new vehicles. Or, as always, a recent-model used option may be best. Whether going green is your top priority, or if you're just looking for the best car you can afford, Canada Auto Loan can help. Even if you have damaged credit, we'll do everything we can to find auto financing options for you. We can, in fact, match you with a local dealership that is able to work with unique credit situations. This will give you a better chance at getting the loan you need to buy the vehicle you want. And, best of all, our service is free and there are no obligations attached. Go ahead and fill out our simple and secure auto loan request to get started today.